UCCS basketball and track athletes saw little rest away from classes. Both the men’s and women’s basketball teams played games against conference rivals, and track athletes were preparing for a start in January. “We captured some big conference wins,” said head Men’s Basketball Coach Jeff Culver. The week before finals in December, the men took on Regis, Colorado Christian and Northern New Mexico Universities in the first three games of conference play. Then they returned from break, squaring off against Dixie State on Jan. 4 and Westminster on Jan. 5, chalking up two more wins for the season. 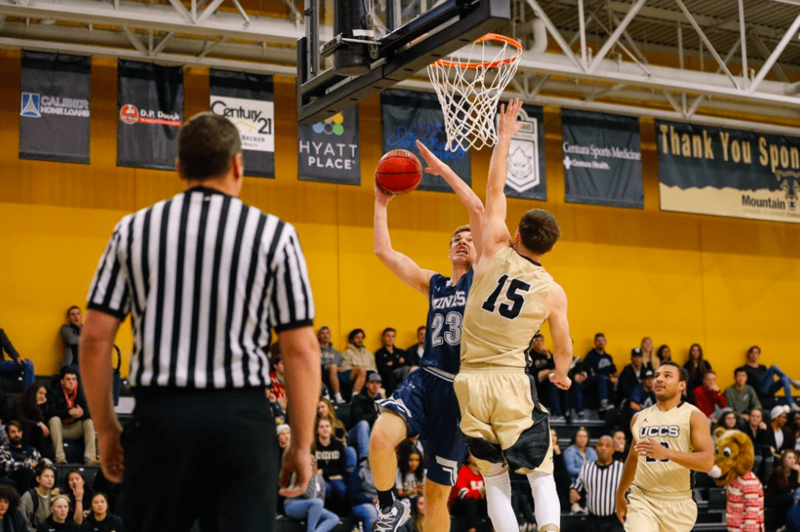 At press time, the Mountain Lions had just finished off Fort Lewis and Adams State, extending their winning streak to eight games. Even with the team beset by recent injuries and sickness, Culver said his players were well prepared, listing Elijah Ross, a senior playing guard who returned from a knee injury on Jan. 11; Dalton Walker, a redshirt senior playing forward who returned from having mono on Jan. 11; and backup point guard Geoff Kelly is out for the season with a knee injury. Over break, the Women’s Basketball team saw a bit more action then the men did, playing 10 games between finals and the start of classes this week. But just like with the men, sickness and injury have been persistent pests. “We’ve been kind of hampered a little bit with injuries and sickness,” said Head Coach Lynn Plett. Plett said that Elly Johnson, a freshman forward, was out with the flu for two weeks. Jae Ferrin, a graduate student forward, hurt her back the first game after Christmas. As a result, Plett said the team’s roster has been limited to only 10 or 11 players out of 16 who are eligible. So far, the team has seen a mixed bag of wins and losses, with a 5-4 conference record at press time, having just defeated Adams State 77-46. Plett said the team’s main goal moving forward is to work on fixing their consistency. UCCS’ track athletes only saw one meet over break, but their break was full of training activity. Hannah Meek, a sophomore and a jumper who is majoring in Communication, said she values the prescribed workouts for what they are. That includes preparing for the Power 5 meet — a meet that was hosted by UCCS on Jan. 19. A tough meet, according to Schrodt, being the first one back from break.